When life echoes itself, when different threads meet at the same place, at the same time, I always find myself surprised and delighted, as if the universe has just gifted me a bit of magic. And so it was with Words In Pain, both the written and spoken. I was in the middle of reading the book Words In Pain, when I went to see the Globe’s production of Richard 11(the all-female, women of colour production. Brilliant, by the way. ), in which the dying John of Gaunt (played by the superb Dona Croll), wanting to talk some sense into the wayward young king, is confident the King will pay heed; for he expects the king to understand that someone in pain, and on their deathbed, has relinquished worldly ambitions and will use the few words they have left, to speak important truths. How wrong he was. Death enters the frame swifter than John of Gaunt could have predicted, for the king has him murdered before the night is out. John of Gaunt may have been deceived by Richard 11, but the promise of truth from those who “breathe their words in pain,” is fulfilled to us by the letters of Olga Jacoby. Written between 1909 and 1913, to her doctor, a close friend who was an orthodox Christian, whereas Olga was a Rationalist, and I would say feminist and liberal, the letters speak directly to us, engaging, thoughtful and passionate. Making me wish I’d known her. Olga comes through with the full force of her feelings, humour and humanity; her tremendous sense of justice and belief that we can make the world a better place. She touches on issues we’re still grappling with, from parenting, social inequality, and the purpose of our lives. 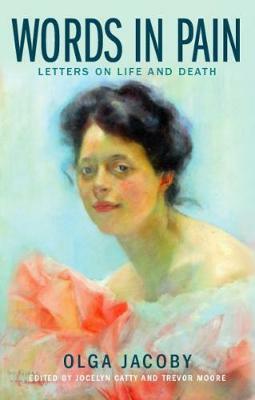 The letters carry her truth, for Olga was under sentence of death. If I received a glint of serendipity, then we have to be grateful for a greater happenstance in having Words of Pain available to us in 2019. A detective story began when Trevor Moore, a retired lawyer, celebrant of humanist funerals, and supporter of Raif Badawi (imprisoned Saudi Arabian blogger, sentenced to 1,000 lashes), came across an anonymously published, old and faded copy of Words in Pain at the Conway Hall library. Intending to spend just a few minutes looking through the letters, he found himself poring over them for hours, “…they were so packed with profound and moving insights that they had an immediate effect on me…”. Using clues from the letters, he embarked on a journey of detection which took him from the National Archives at Kew, online resources, and the 1911 Census, to a household on Crediton Road (later Crediton Hill) in North-West London; to Olga Jacoby, her husband Jack, and their three adopted children (joined by a fourth one later). Adoption was very unusual in the early twentieth century, making Olga and her husband that much more remarkable. 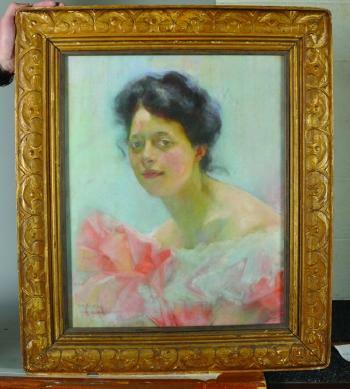 Continuing his research, Trevor traced Olga’s descendants, and coming across the information a portrait of her existed, tracked down the owner and managed to acquire it. Though never free of pain and confined to a bath-chair Olga is fully involved in her children’s lives, parenting with a desire to have her children grow up happy and emotionally secure, to “…have faith in themselves…and to shape their life according to their own ideal. …This ideal must not be a selfish one, but one that will help towards better conditions for all.” Firmly believing that our life purpose must include being of service to others. Critical of many of the social ideas of her time, Olga declares there’s no such thing as an illegitimate or legitimate child, all children are of equal value. She also refuses to give grand dinner parties, seeing no need to over-feed the already well fed, and finds that she and her husband are left with a smaller group of friends but ones’ whose company they actually enjoy. Writing to her doctor, a profoundly religious man, Olga lays bare the bones of religion: “But the vigilant priests have armed themselves and their God with weapons cruel enough to frighten many into blind servitude.” Olga asserts the importance of individual conscience and freedom of thought. At the end, death didn’t have to come for Olga, she herself went towards it. “I am feeling worse and worse and worse, and can see no way of shortening the agony.” After writing farewell letters, she takes an overdose, and slips away – like music softly fading. The book uses the word suicide but I prefer to use the word euthanasia. Even in the manner of her going, Olga lights an issue our society has yet to decipher and decide upon. An intricate, complex, moral and ethical problem, which demands our time, finely balanced judgment, wisdom and humanity, so we may allow relief to those living in agony or other torment which cannot be cured, and who have clearly expressed their wish to end their lives. Just as Olga did.